It may seem like the “best” option money can buy, but it doesn’t always provide the best experience. The truth is that it is impossible to get a taste of the islands and seas without heading out to something much smaller and more intimate. This is where tourists turn to multi-hull boat vacations. The best way to see the Bahamas is a chartered voyage – either crewed or bareboat – on dedicated vessels. There are two options when picking a charter on a multi-hull vessel for a Bahamian cruise. The first is to pick a crewed vessel for a family trip or a corporate retreat. These boats provide the perfect chance to kick back and relax while bonding with friends, relatives or co-workers. There are lots of options in cruises and activities across these islands. Water sports are a big part of many of these chartered trips – especially snorkeling. Some of the best charters and boats will have water sports equipment and other craft as part of the package. This allows for paddle boarding, kayaking, diving and more. Snorkeling is essential in the Bahamas as there are so many Cays, reefs, and shores teeming with interesting life. A multi-hull trip means that tourists can avoid the busier areas, like the Lucayan Caves and Silver Point Reef, and head to lesser-known areas around San Salvador. Of course, many travelers will use this time to get closer to all kinds of local wildlife. Some prefer the idea of swimming with dolphins or sharks, but few can resist the swimming pigs of Big Major Cay. Why choose a multi-hull vessel for this crewed adventure? One of the key selling points with these multi-hull boats is that they are spacious. Many provide a great layout of rooms and suites to accommodate different guests. It is essential that all travelers look at the floor plan and other information before picking a boat with a hire company. They all have different approaches and layouts, but most are most spacious than guest imagine. This means more space to move and stretch out, both above and below deck. This deck space is another big selling point of the catamaran charters. There is so much more room to stretch out and sunbathe. On top of this, they are also stable enough for a relaxing experience. It is an excellent fun out on the ocean, especially in calm waters where it is peaceful and relaxing. But, the journey through the waves and current can cause swells and rocking. This isn’t much fun for those with weak sea legs. It is also a problem for food and drink, or for fragile items on precarious surfaces. A stable, flat catamaran reduces these risks. The boat should be able to cruise along while guests drink cocktails and they won’t lose a drop. Bumps will occur in heavy swells, but the overall experience is calmer. Some top chartered crewed multi-hull vessels for a Bahamian vacation. Large groups will see the same advice on travel sites and review sites. Anyone that wants a great day out on a crewed boat should see Bonnie. Bonnie is infamous in Nassau for her chartered cruises and great hospitality. There are different types of tour depending on the activities that guests have in mind. There are “land and sea” tours with a complete sightseeing trip of the area. The beach day adventures are great for those that want something more relaxing. Then there are the trips with snorkeling in mind. Those that specifically want to swim with the pigs should contact Sunset Marine and Boat Rentals. This company operates catamarans from Green Turtle Cay Abaco for day trips to see the pigs and spend time in the water with them. Tourists recommend this crewed adventure because the Captain is never in a rush and provides food to feed the pigs and turtles. There is also room for a detour where possible. Then there is the option of the bareboat multi-hull boat vacations in the Bahamas. This bareboat option removes some of the luxuries associated with those corporate trips. However, the upside is the sense of adventure. Anyone with sailing experience and taste for adventure can hire a catamaran and head out to lesser-known areas of the Bahamas and their Cays and islets. Most families and groups of friends will prefer the idea of a charter with a skilled crew, chefs, and other friendly staff on-board. This approach lets travelers unwind while professionals get on with the jobs of steering the boat between destinations, preparing food and keeping things clean. However, there will be many keen sailors that fancy the chance to take control. Those with experience in sailing catamarans can hire a bareboat option. This provides the opportunity to act as captain and tour guide for more fabulous adventure. There are pros and cons to this approach. The benefit is that sense of independence and control over the holiday. Those that sail won’t always feel comfortable sitting back when they can chart their course and handle the boat themselves. This allows for adventures into areas that aren’t still part of the tourist trails. Some chartered, crewed multi-hull trips in the Bahamas may stick to tried and tested crowd-favorites. It was important to remember that there are 29 islands here – not just the port of Nassau. Then there are the 2400 islets and 661 cays best reached by a smaller catamaran. The downside is that there is no crew to help out and fewer luxury elements. Some crewed boats will provide equipment, such as those for the water sports mentioned above. Those going bareboat will have to do it alone. It is difficult to pass up the chance to explore somewhere new. This idea of exploration and discovery is essential for a meaningful, memorable approach to a multi-hull boat vacation in the Bahamas. Travelers choose their route and destination and gain more from the voyage and result. They aren’t the first to find it, but there is still accomplishment there. A great place to head to for a different look at the Bahamas is a northern group of islands known as The Abacos. This is a more relaxed, laid-back part of the country with a lot of history and beautiful scenery. These small islands make great landing areas to the beach the cat and spend a relaxing afternoon. It isn’t a long journey either, as they are just 35 miles from Nassau. Sailors can go anywhere they choose to enjoy a perfect evening of food, drink, and good company. Some travelers will choose to take all of their supplies on board and cook on the boat. This is a great idea for some quality time without other restaurant patrons to worry about. Still, it is fun to moor up one of these multi-hull cats by a fancy restaurant and treat loved one to some excellent fish and seafood. The full deck of the cat is also ideal for watching the sunset and stars with loved ones over a glass of something special. Tourists should keep a look out for the green flash at sunset. This is a brief moment when then the setting sun goes bright green as it drops below the horizon. The conditions have to be just right, but it is an excellent moment onboard these vessels. Why are these multi-hull vessel so suitable for these bareboat adventures? These catamarans have excellent safety records and agility. This means the chance to go further than other sailors, but also to do so with confidence in any weather. Nobody should overlook the risks of storms and severe weather with these chartered multi-hull adventures. This is true for those on bareboat options and those with crews. The weather can turn nasty, and sailors need to be able to handle the boat and the conditions. 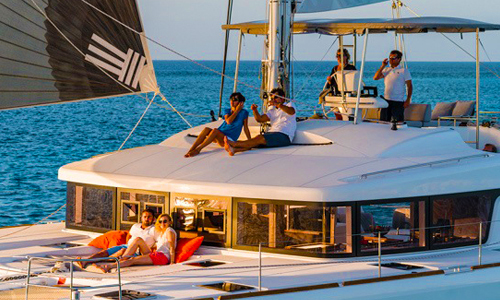 This is where these multi-hull catamarans offer even more appeal. There are always safety concerns about boats tipping over and capsizing in storms and high waves. The shape and stability of the cat lessen this risk. Furthermore, most of these cats contain closed-cell foam reserve buoyancy across the vessel. This means it is more likely to float. Tourists also love these boats because they can cruise between islands and in shallower waters – mooring up at different locations for a day trip. This is great for snorkeling in shallow reefs in lesser-known areas. The shape also means they can beach up on an island for easy access and camping. On the subject of agility, these cats and trimarans are often faster and better able to handle the waters than some single hull boats. The speed also means they can avoid bad weather more easily. This adds to the safety features mentioned above. Some top bareboat multi-hull vessels for a Bahamian vacation. There are plenty of boat rental services across the islands that cater to this group because they understand how popular it is. Those heading to Nassau can take a look at Navtours and their range of bareboat catamaran options for easy access to a high-end vessel. Those that want to start from Abaco should try Dream Yacht Charter. This company offers an add-on of a transfer from the airport. An interesting alternative option for the truly adventurous is to try hiring a boat from the Florida Keys and sailing it to the Bahamas and back. This is an option for Fun in The Sun. The perfect multi-hull boat vacations in the Bahamas need great facilities. These catamaran cruises in the Bahamas also mean plenty of luxury items. Whether tourists choose a bareboat or crewed option, there are some great, high-end vessels to choose from. This isn’t the cheaper, lower-end approach just because it isn’t a 5-star cruise liner. In fact, the hospitality and personal service of the boat’s owners and crew can feel even more special. Patrons see this in many ways. The first is the food and drink. The onboard hospitality and catering of these top services mean professional chefs and kind service. Guests receive great meals served above or below deck, depending on the layout of the boat and weather. Those trips to top restaurants are fun for a change, but the quality on board is comparable. The bartender skills of the crew also mean the opportunity for a “second” green flash. If the natural one does not appear in the sky, ask the crew to make a round of green flash cocktails. Bartenders then serve with ice, and a cherry and orange slice for garnish. The second factor here is with the rooms and cabins. Different options and layouts are depending on the boat – and the money poured into its décor and fixtures. Travelers can be sure of comfortable cabins with great designs and facilities. Some with have bathrooms for each bedroom, spacious living areas and dining areas above and below deck. The great thing about companies that charge per head is that it is easy to split the costs of the whole party. Multi-hull boat vacations in the Bahamas are the best way to cruise the islands. Traditional cruises of the Caribbean are fun, and offer plenty of high-end luxuries and experiences. The problem is that this means a quick, organized stop off at the most obvious places in the Bahamas. A catamaran hire means a week or more of exploration across the different islands and bays. Tourists can discover so much more, at their own pace, while engaging in significant activities and enjoying excellent food. Travelers don’t miss out with this smaller boat. In fact, they get to see and experience a whole lot more.